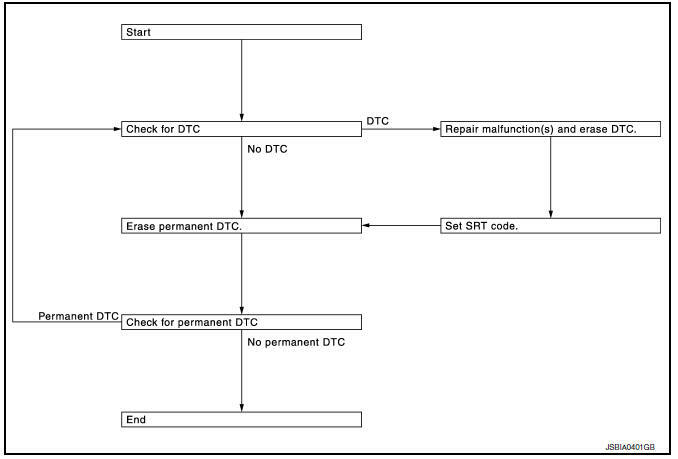 When a DTC is stored in ECM When a DTC is stored in ECM and MIL is ON, a permanent DTC is erased with MIL shutoff if the same malfunction is not detected after performing the driving pattern for MIL shutoff three times in a raw. *1: When the same malfunction is detected in two consecutive trips, MIL will illuminate. *2: MIL will turn off after vehicle is driven 3 times (driving pattern B) without any malfunctions. The erasing method depends on a permanent DTC stored in ECM. Refer to the following table. If the applicable permanent DTC includes multiple groups, perform the procedure of Group B first. If the permanent DTC is not erased, perform the procedure of Group A. *: For group, refer to EC-94, "DTC Index". For permanent DTC items, MIL turns ON. Refer to EC-94, "DTC Index"
Is any DTC detected? 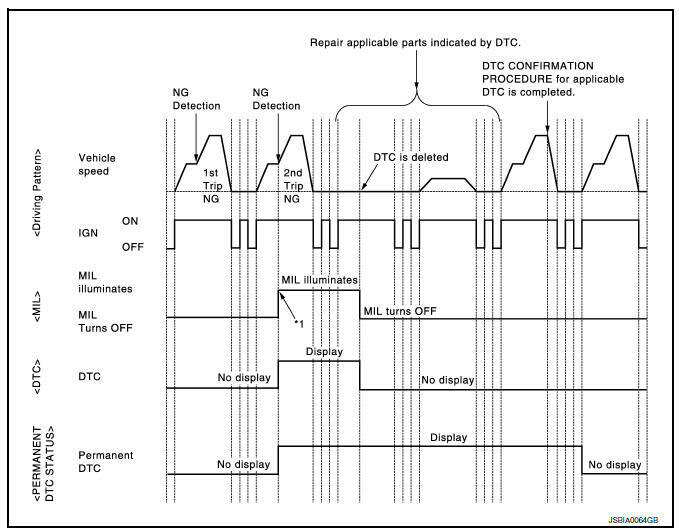 YES >> Repair malfunction(s) and erase DTC. Refer to EC-63, "On Board Diagnosis Function", EC-66, "CONSULT Function". Select вЂњPERMANENT DTC STATUSвЂќ mode with CONSULT. Select Service $0A with GST. Is any permanent DTC detected? YES >> GO TO 3. Perform вЂњDTC CONFIRMATION PROCEDUREвЂќ for DTCs which are the same as permanent DTCs stored in ECM. Refer to EC-94, "DTC Index". Is any permanent DTC detected? YES >> GO TO 1. *2: After experiencing driving pattern B and D, permanent DTC is erased. *3: Indication does not change unless the ignition switch is turned from ON to OFF twice even after experiencing driving pattern B or D.
Drive the vehicle according to only driving patterns indicating вЂњINCMPвЂќ in driving patterns B and D on the вЂњPERMANENT DTC STATUSвЂќ screen. If self-diagnosis results are erased during the trip of driving pattern B or D, the counter of driving pattern B and D is reset. Use вЂњPERMANENT DTC WORK SUPPORTвЂќ mode with CONSULT to drive the vehicle according to driving pattern B. 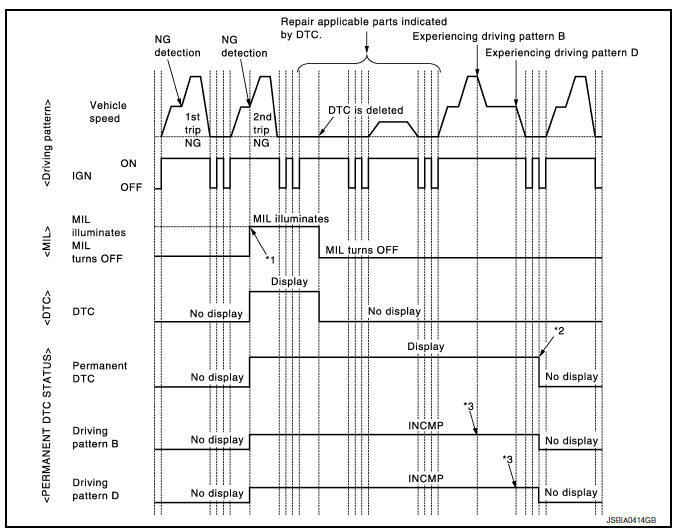 Refer to EC-66, "CONSULT Function", EC-60, "DIAGNOSIS DESCRIPTION : Driving Pattern". Drive the vehicle according to driving pattern B. Refer to EC-60, "DIAGNOSIS DESCRIPTION : Driving Pattern". Is any permanent DTC detected? YES >> GO TO 5. Drive the vehicle according to driving pattern D. Refer to EC-60, "DIAGNOSIS DESCRIPTION : Driving Pattern".